What is a HVAC Power Exhaust? 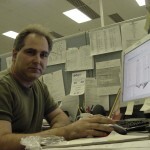 A previous MicroMetl Blog article offered a basic understanding of economizers. It is an Economizer 101 Summary and is a prerequisite to this article if you don’t understand the meaning of an economizer & mixing box. Improper ventilation can be the cause of headaches, dizziness, drowsiness, fatigue, nausea, eye irritation and respiratory problems. Poor indoor air quality is not always caused by the design of a building. It is just as important to supply fresh outside air, and provide proper ventilation. As HVAC personnel we must understand the fine balance between providing fresh outside air, and the economics of having to properly condition it. 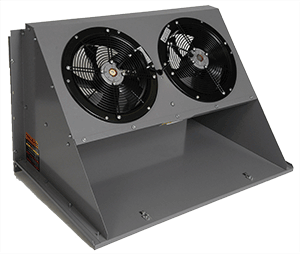 When a rooftop unit includes an economizer, the system must also include an effective method for allowing excess air to escape the building, or undesirable over-pressurization can occur. This effective means is known as a Power Exhaust. Power Exhaust & Economizers are like peanut butter and jelly… They belong together. Barometric relief dampers are an option, but typically aren’t capable of removing enough building Return Air (RA) to provide the desired building space pressure. Therefore, a Power Exhaust can be added to an economizer to adequately relieve building pressure. If an economizer is allowing fresh Outside Air (OA) into your building, it is being forced into your building under pressure from the fan inside your furnace or rooftop unit (RTU). Similar to a balloon, as additional air is introduced into the building, pressurization develops. If you’ve ever attempted to enter a building and had difficulty opening a door which pushes into the building, or noticed a door pushing itself open, you experienced a positive building pressure problem. Too much air is getting introduced into the building with no way to escape. A Barometric Relief is a passive, low-resistance path for excess air to exit the building. It will only react to excess pressure. The blades of a barometric relief damper are designed to pass air in only one direction… out of the building. Outside air cannot hypothetically enter into the building through the relief blades. A Barometric Relief is a blade, or set of lightweight blades which allow air to escape the building when positive pressure occurs. Not all economizers are designed with a Barometric Relief built-in. Of those Barometric Dampers included with economizers, most are not designed to remove 100% of the outside air causing pressurization problems, and requiring a Power Exhaust to complete the job. What is a Power Exhaust? Under most circumstances it is desirable to maintain pressure slightly higher than the outdoor pressure. A Power Exhaust is a motorized fan designed to remove varying volumes of air efficiently. It can remove the high positive pressurization, and possibly create a negative pressure within the building’s environment if not properly installed and maintained. If negative pressure occurs, leaky windows, doors and electrical fixtures will allow the outside air to creep in causing drafts or hot spots within a room. When a Power Exhaust is designed to run at a single speed, it is considered to be a “Constant Volume Power Exhaust.” It is started or activated based on the position of the economizer’s outside air damper. A switch applied to a blade or the motor of the economizer is set to activate, or start the Power Exhaust. The Power Exhaust should activate when the economizer blade(s) open far enough to allow in more air than the barometric relief allows to escape. The positioning of the switch is field set. Additionally, the fixed speed of a Power Exhaust must be set according to each application. Skilled air balance personnel should be considered in the installation of a Power Exhaust to be certain it activates at the appropriate time, and operates at an optimal speed. One speed does not fit all applications. 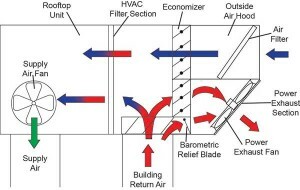 There are times when pressure problems can still occur with a “Constant Volume Power Exhaust.” If the rooftop unit contains a multiple speed fan, occupants are running bathroom or kitchen fans, and depending upon the amount outside air the economizer is allowing into the building, negative or positive pressure conditions will occur. The Modulating Power Exhaust is coupled to a pressure transducer. The pressure transducer is a sensor with an air hose or orifice which detects the pressure inside your space, and compares it to the pressure outside. You may now pin point your specific desired pressure set points. The pressure transducer is electrically connected to a motor controller via a Variable Frequency Drive (VFD). The VFD will control the speed of the motor according to the building pressure. It will speed up, slow down, or stop to fulfill the set point of the pressure transducer; always returning optimal results. Most often the engineering specifications for a building will allow you to wisely choose the best Economizer & Power Exhaust combination. MicroMetl’s Customer Service Department is always available to offer guidance and assistance. MicroMetl offers a wide range of combinations to suit your specific needs and applications. How can I get spec's on a mixing box? problem with the medical building HVAC system? HVAC maintenance on such units requires expert technical knowledge and problem solving skills. A clogged line can cause water damage to the hot air furnace and other areas of the room. or her career if they listened to their customer, this can make their job a whole lot simpler.